We believe in a conservative approach to dental care. The caring, experienced team at QVC Dental Port Kennedy understands that it’s vital to keep your natural teeth in any possible situation. 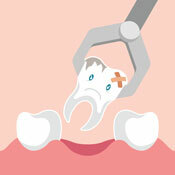 If determined to be necessary, we can gently provide removal of any teeth, including your wisdom teeth. We’ll take a thorough look at the tooth that is to be removed to understand the simplest, quickest way to do so. With wisdom teeth, we’ll refer you to have a full mouth X-ray taken, which is bulk-billed at no charge to you. We’ll examine these images to ensure that an extraction performed in hospital isn’t necessary. If it is, we’ll refer you to a specialist that we work with to have the procedure done in a controlled environment. Contact our friendly team today to book your time! We welcome emergency cases and are here for you six days a week.